What could be better than eating breakfast outside on a warm, sunny morning? Um, nothing. After a few too many puddings over winter (and a few too many kilos to show for it) I'm back to starting the day with a bowl of homemade muesli, poached apricots (what I have left from last summer's bounty) and the first of the season's fresh blueberries. Hopefully I'll be able to fit in to my jeans again soon! 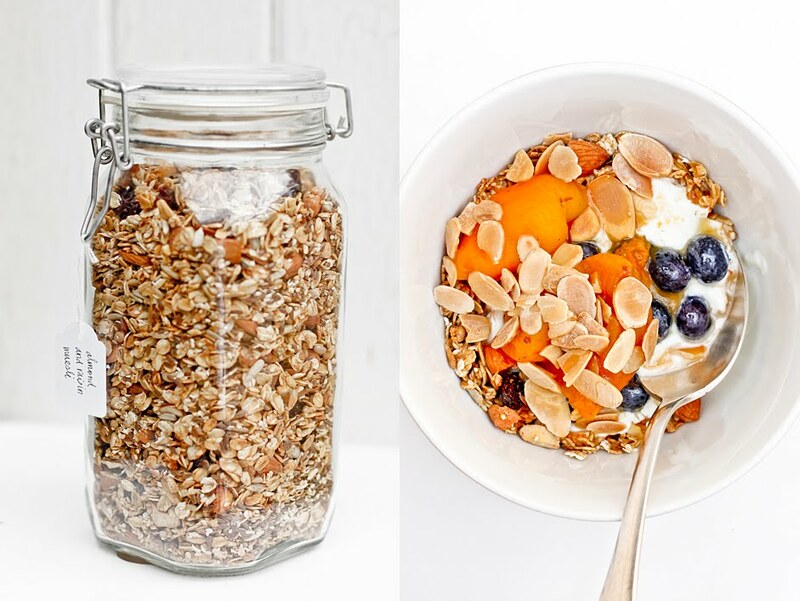 Mmmm, looks delicious...just out of interest what do you put in your homemade muesli? All mixed together with a good slurp of unsweetened apple juice - about half a cup - 3/4 cup (not too wet or it goes gluggy). Bill says to add some oil too but I leave it out and to be honest I didn't notice the difference so I prefer to keep it low fat where possible. I then divide the mixture between two baking sheets (lined with paper) and bake at 150C for about 15 minutes. I then give each tray a good stir and at this point add around a cup of golden raisins, spread evenly over the trays. They go back in the oven for another 10-15 minutes by which time the raisins have puffed up (but aren't burnt) and everything's toasty brown. To serve I add low fat yoghurt, blueberries, poached or canned apricots (depending on the season), sometimes a bit of honey but always a sprinkling of dry roasted almond flakes which add great crunch. Please do let me know if you try it and what you think.